Former Sarawak PAS election director Mohd Fidzuan Zaidi has confirmed that he left the Islamist party two days ago. Although the outcome of the elections at the party’s muktamar last week- which saw the progressives camp being purged from the party – was not the main reason he left the party, Fidzuan did not deny that he was quite disappointed with the results. “Yes, I’m a bit disappointed. But it’s normal, like when a team we support loses. “Like football teams Manchester United and Liverpool, there’s dissatisfaction if they do not win. But it’s not my main reason for leaving PAS,” he told Malaysiakini when contacted. Fidzuan said his main reason for leaving the party was because he wanted to focus on his career and to take a break from politics. Fidzuan’s leaving comes after Santubong PAS commissioner Andri Zulkarnaen Hamden denied that party members were leaving the party. “Many have asked me on the issue faced by the Sarawak PAS leadership as of late. “I want to stress that all those speculations are just rumours,” Andri had said. Fidzuan who has been with PAS for 20 years explained that he was the type who could only focus on one thing at a time. “I am a determined person, so when I do something, I do it wholeheartedly and one at a time. He also denied that the conflict occurring between the party’s two camps was a reason why he had left the party. “No, it’s just that if I am still a PAS member, I still have a responsibility in the party,” he said. He was also open to the idea that he could re-join the party in the future as it all depends on his career. Fidzuan has also yet to receive a response from the party’s top leadership over his actions. 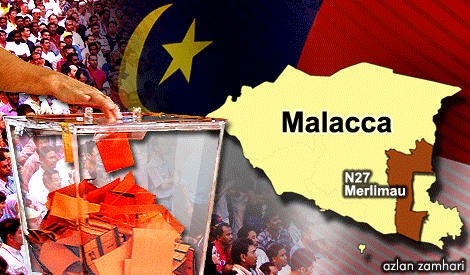 Surprises In Store for Opposition in Sarawak..!! KUCHING: Parti Pesaka Bumiputera Bersatu (PBB), the backbone of Sarawak Barisan Nasional has prepared a few surprises for the opposition for the coming state elections. 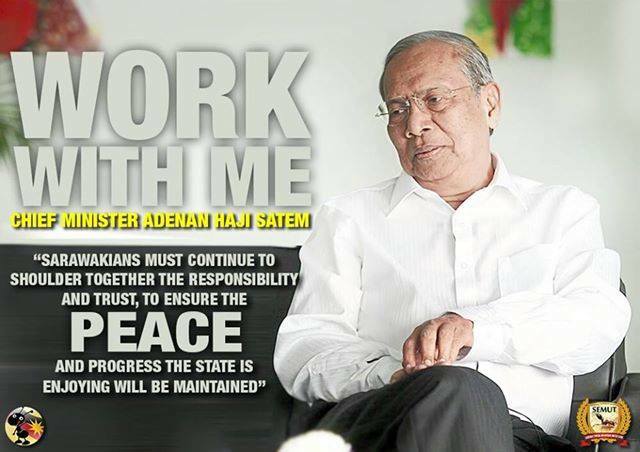 PBB President, Adenan Satem said the state elections could be called anytime between now until June 2016, when the current term of the State Legislative Assembly would expire. “We have a few surprises for the opposition, which we will not reveal now,” he told a press conference after chairing the PBB supreme council meeting here. At present, PBB holds 35 of the 71 Sarawak state assembly seats which they won in the last state election held in 2011. ARE YOU READY TO RUMBLE….??? One thing is certain over the next 12 days in Kuala Besut – PAS’ Azlan Yusof and Barisan Nasional’s Tengku Zaihan Che Ku Abd Rahman will heap voters with loads of promises. Both outlined their vision for voters at different times today for the Kuala Besut by-election campaign, which starts tomorrow. Azlan, 48, wants to work on the improving the lot of the community if he tops the polls. “I am to going to focus on three important areas namely the high poverty, the high unemployment rate and the social problems in the area,” he said at a press conference held at Kampung Baharu PAS headquarters this evening. Che Long, as everyone fondly calls Azlan said his strategy during the campaign was simple. “I am going door to door. As it is Ramadan I will go to the many talks and other religious activities here during the campaign,” he said. But it will be tough for Che Long. 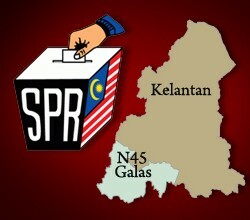 Of the past 14 general elections, all were won by Barisan Nasionalexcept for 1959, 1969, 1974 dan 1999, which were won by PAS. Over at the BN, engineer Tengku Zaihan Che Ku Abd Rahman, 37, ready to sacrifice family life for voters if he won. “They understand that this is how things are now. I will get busy but this does not mean I do not think about them,” he said. Zaihan who used to work as an engineer in Putrajaya now no longer has the luxury of the 9 to 5 job. Since BN deputy chief Tan Sri Muhyiddin Yassin announced him as the party’s choice, he has been busier than a bee with endless meetings here. The Universiti Sains Malaysia trained civil engineer is married with four children. His rival Che Long who owned a string of businesses, is married with six children. The ground is shifting especially with the imminent General Elections around the corner. There are more than a few whispers amongst the grassroots of PBB that certain incumbents will have to forgo their seats for a new face. IS PAS SO SIGNIFICANT THAT PBB IS TROUBLED..?? PAS and not PKR Will capitalise if BN some of the present incumbents are not replaced. Smses are exchanged and some of them if published will immediately expose the whole plot. We will give you more insights and tasty revelations when the time is right. It’s does point to the fact that it is really getting really heaty in the corridors of power in Putrajaya but also at every available cafes/ coffehouses/lounges in Sarawak especially when it involves the PBB14. Suffice to say the main stream media has added more flavours to an already volatile situation by using the article”Wooing Chinese Voters” to put more pressure on two areas of concern which have more than one occasion kick up a storm. Very soon teacups will fly as Federal leaders are already been fed the information. This was frontpaged:-Deputy Minister in the Prime Minister’s office and BN information chief Ahmad Maslan was quoted to have said this,”the coastal seats of Batang Lupar and Sadong Jaya where PAS seemed to have made inroads to the Malay areas. So there musts be some truths for PBB to be worried as these areas will certainly see some resistance and also a shift towards the Islamic Party PAS . Is PBB losing its grip? The incumbents will obviously be looking over their shoulders as they know their FATE lies not only as winnable but also VOTAEBLE against the PAS/PKR candidates. It’s more than a hearsay when reports filter up to the Prime Minister,Chief Minister and also President of PBB that certain issues are seen to be cropping up which needs immediate attention or to be addressed. 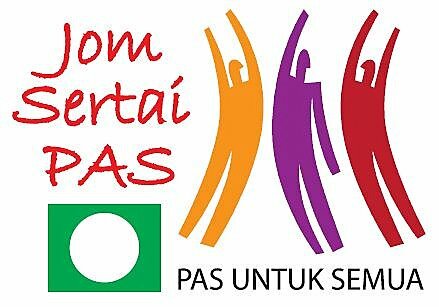 Its not only PBB grassroots who have voiced up but certainly seasoned PBB State ministers/assistants have also shown concern that PAS have made inroads and are also part of the plot. The PAS machinery have shown to be delicately poised to bring some of the PBB14 incumbents down and to ensure that PBB does not make a clean sweep. It’s all part of the bigger picture which will ultimately see an end to the invincibility of the present PBB setup. Whether PAS is part and parcel of the scheming and plotting of the PBB14 will remain a calculated guess until the results are announced on election day. Call it ABU9 or the Untouchables 5 which makes up PBB14 but PAS knows its facing a HERCULEAN TASKS. Cindy of audie61 received a call from her former malaysiakini colleague,”Ada dengar tak,Calon BN N45 mungkin blogger. Tahu Siapa..?? Syed Azidi Syed Abdul Aziz ” Kickdefella blog” Ada juga nama2 lain yang di sebut. OK . The name of Kickdefella is enough to send reverberations up the spine of PAS as lately his posting has been very critical of PAS. He was once a a close associate of Kelantan PAS Deputy Commissioner II Husam Musa – had a much-publicised fallout with PAS last year. There are also other names which have been mentioned. The lists of potential candidates and names started cropping up when it was reported that MP Tengku Razaleigh Hamzah who himself was expected to be fielded as the BN candidate, he, as the BN and Umno election director, was believed to be inclined to choose another candidate. Thus besides Kickdefella the others in the running are Gua Musang Umno secretary Abdul Aziz Yusof Gua Musang Umno Youth vice-chief Zamzani Harun Gua Musang Wanita and Youth wings Wan Hazani Mohd Nor and Bazlan Baharuddin. It will be interesting to see whether UMNO will choose a Blogger to represent them instead of practising from the traditional and normal political platform. WILL THEY JUST DO IT THIS TIME AT N45..?? ?